Bold and exotic. This 8mm wide tungsten wedding band has a Mokume Gane inlay that is exciting. The base color is 14k yellow gold. The darker color is our "Shokudu", which is 95% pure copper and 5% 14k gold. Be noticed; wear the BENGAL! Manufactured by Jewelry Innovations here in the USA! Looking at the picture, I expected two things. One was for the the insert to be bold yellow gold with a dark black inset that really stands out. 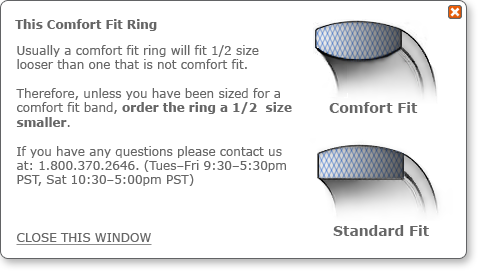 The second is it looks like there are black colored bands on the outer edges of the ring. I like things that are two-tone and really "pop" and so I was immediately attracted to this ring, though it took almost a month to finally decide on it. The ring I got isn't a match to the picture. My first sight of it was in outdoor sun and I could hardly discern the mokume gane from the titanium band; the gold is more of a rose tone and has very little yellow color, and the black isn't very bold. In indoor lighting, the contrast is more apparent but it still pales (literally) in comparison to the picture (which I have seen on at least four different computer screens so it's not my display). The ring must have been photographed in the shadows and/or touched up quite a bit; the outer bands are just channels cut near the edge of the ring and are not dark at all. One other thing that bugs me is that there are fine radial scratches in the mokume gane that run all the way around the ring. It looks like the jeweler forgot to finish polishing it. It was immediately noticeable to me and really distracts from the appearance. I'm really disappointed with what I received versus what I expected. I came back to the site to review the picture again and make sure I wasn't hallucinating (I wasn't). Even my pictures taken under fluorescent light show more contrast than in person. 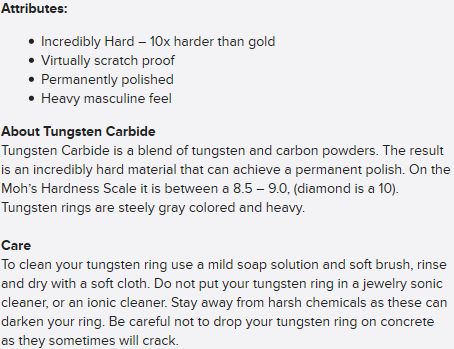 The positives are that the craftsmanship of the titanium band is good, and it is a comfortable band - but it is a fairly large and heavy ring 14 grams or for the metrically challenged, 1/2 oz. I did see probably the same ring on another website (search for it) and their picture was very similar to what I actually received - very light contrast between the mokume gane and the titanium band. In one of my pictures you can see the ring next to a 14K gold chain and 18K pendant. My fiancee saw the pictures and couldn't believe that it was the same ring I ordered. Her first comment was, "it looks like silver, not gold." Funny, that was my first thought too. It's going back for a refund, and my search for something unique begins again. Sigh. This band is great! The tungsten stays beautiful, and refelcts the metal very nicely.